Miami, FL hard rock band GEARS has released the official music video for their single, “Tango Yankee” featuring Lajon Witherspoon of Sevendust. Originally premiered on Tattoo.com, “Tango Yankee” was produced by Corey Lowery. “With ‘Tango Yankee,’ we just really wanted to write something dedicated to several members of our families that have served in the Military, Law Enforcement, and First Response. We really wanted this to be special, so getting one of our favorite vocalists from one of our favorite bands was very exciting and made this track just that, special. Lajon came in and absolutely crushed the track vocally. I really love the way it turned out. Trip and LJ complimented each other so well. Put that together with Clint‘s epic solo and of course, Corey at the helm, this really turned into something spectacular. I believe that the thought behind the song is something that most Americans can relate to as many of us have or have had loved ones serve. Maybe even a little something that can get us past all of our political disagreements, unify, recognize the sacrifice and just say a simple ‘Thank You’ to all those who fight for our freedom, protect us and keep us safe.” says Jimmy Wooten of GEARS. Miami based hard/heavy rock act GEARS isn’t your average start-up garage band. Despite being confronted with a near disastrous setback at the cusp of their debut, headlining tour, jarring line-up changes, and financial challenges, the band has persevered and rebuilt. Founded in February 2014, Trip 6 (Urban Rebel), Eli Parker (Endo), Tommy Herres (SCARLET CARSON) and Jimmy Wooten (SKINMASK) were all looking for new projects as their old ones had run their course. We all wanted to do something more modern, but still rang true to our influences. Something that we could aggressively market and tour on. So, we all met up in Miami after months of talking about doing something together and what came out was the first EP, Set in Motion. They released Set in Motion in May 2014, immediately launching into their first headline run with support from I-Exist. Just three days into the tour, their equipment trailer disconnected, resulting in a massive, horrific accident; not only did they lose their gear, but the tour van was totaled and the band members sustained serious injury. In spite of this tremendous blow, the group endured and continued the tour without missing a beat. 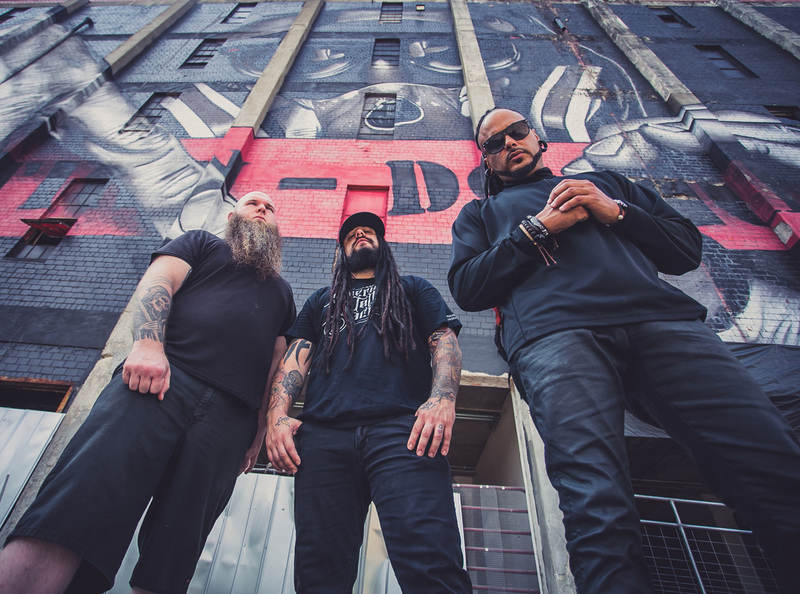 In June 2015, Wooten and Six teamed with Corey Lowery (Saint Asonia, Stuck Mojo, Stereomud, Dark New Day) and Troy Mclawhorn (Evanescence, Seether, Dark New Day) on their new EP Pride Comes Before the Fall, and announced the addition of new members Bobby Thomas and Chris Dorame. They hit the road for their Riser Tour, once again with I-Exist, in July, wrapping up the run in September, but kept the momentum going with the digital release and lyric video for their debut single off of Pride Comes Before the Fall, “Face Down”. The band rounded out the year with the release of their much anticipated sophomore EP on November 10th, with both headlining tours and a support slot with Trapt slated for 2017. After a very successful tour in 2017 with Seasons After and Bridge to Grace, GEARS has released a new single and video for “KING.” Once again, joined by Corey Lowery in the studio, GEARS continues to evolve. Boasting an even heavier sound with groove and aggression, they set out for Headlining Dates as well as Support Slots with Nonpoint, Upon a Burning Body and will round out their 2018 Summer/Fall Tour Dates with the last of 3 legs with All That Remains concluding at the end of September. After touring much of 2018 with All That Remains, GEARS has shifted focus to releasing more music. Their first 2019 offering will be “TANGO YANKEE’ which features LAJON WITHERSPOON of SEVENDUST.